Learn about our recommendations to mobilize healthcare to help more Americans prioritize and celebrate physical activity and thus achieve recommended physical-activity levels, improve health outcomes, and reduce health disparities. Watch the video and imagine U.S. culture prioritizing and celebrating being physically active, prompted by healthcare and communities working together. Roadmap identifies steps to get 50 percent of Americans in all demographics to recommended levels of physical activity by 2035, sparked by concerted action in healthcare and the communities it serves. Prescription for Activity Task Force, which authored the plan, turns its focus to implementation. Understand the detailed recommendations for how healthcare, working in close concert with the communities it serves, sparks a more physically active nation. See the systems-change map and the path it represents to a future America where people of all ages, income levels, and demographics meet recommended physical-activity levels. 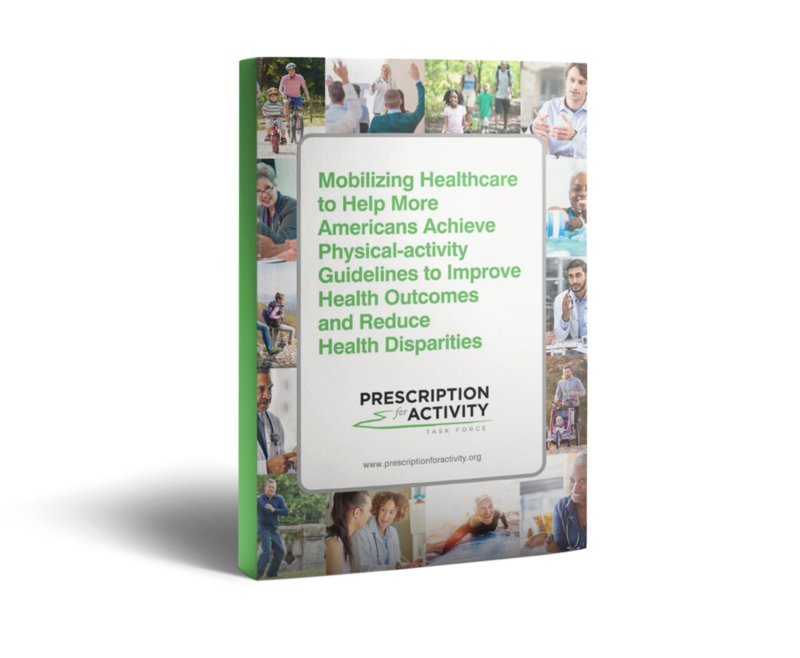 See the list of Prescription for Activity Task Force participants, the group of 60+ national experts, thought leaders, and luminaries from healthcare, academia, business, philanthropy, and government. All share a belief that physical activity–based behavior-change interventions should be more integral to healthcare. Learn in three short pages how the PfA Task Force developed its systems-change map with a focus on health equity and an eye toward the implementation phase, when theory turns to action. The PfA Task Force is committed to highlighting and supporting the great, relevant work already in motion across the United States. In an effort to maximize our collective efforts, the PfA Task Force aspires to build upon this existing work and develop a framework and implementation plan to help align and accelerate these initiatives.